Doopsgezinde Vermaning Church at Monnickendam. Monnikendam (Monnickendam) is a town (1947 population 2,762, with 169 Mennonites; 2001 population 9,546) in the Dutch province of North Holland, from the beginning of the Reformation a center of Protestant activity. On 20 November 1527 Wendelmoet Claes of Monnikendam was burned at the stake in The Hague. Though this martyr is listed in Offer des Heeren and the later Dutch martyrbooks including van Braght's Martyrs Mirror, she was not an Anabaptist in the strict sense but a "Sacramentist", a group which helped to prepare the soil upon which Anabaptism could flourish. In Monnikendam there were soon many Anabaptists. In 1534 the Catholic priest of Monnikendam reported that probably two thirds of the city was "contaminated with the Anabaptist doctrine." In 1535 the persecution in North Holland began, with its center in Monnikendam. Many Anabaptists hid in the reeds or fled to Amsterdam. Therefore the number of Anabaptist victims who were natives of Monnikendam was not very high. At Monnikendam Arent Jacobsz was executed in 1539 with his wife and son. Among the Anabaptists of Monnikendam revolutionary Münsterite influence was very strong, and many of them were in the boats which crossed the Zuiderzee in March 1534 en route to Münster. When the persecution subsided there was a large group of peaceful Anabaptists in the city. Leenaert Bouwens baptized 62 persons here in 1563-1565 and later another six persons. Pieter Willems Bogaert, who was a preacher (ca. 1565) and elder (1588) of the Frisian congregation at Monnikendam, presented to William of Orange the considerable sum the Dutch Mennonites had raised to help in the liberation of Holland from the Spanish yoke. Concerning the history of the Mennonites of Monnikendam there is little information. Besides the Frisian congregation there was a Waterlander congregation, with which the Frisian seems to have merged soon after 1600. In 1675 the Monnikendam congregation, then numbering 150 members, requested admission to the Lamist Sociëteit. Some four decades earlier it had joined the Rijper (Waterlander) Sociëteit. In all the collections organized by the Dutch Committee of Foreign Needs, several times in 1672-1736 in behalf of the persecuted Mennonites in Switzerland, the Palatinate, Jülich, Prussia, and Lithuania, the congregation of Monnikendam contributed liberally, though their number was rather small and decreased with the decline in the population of the town whose business of shipping to the Baltic Sea was severely injured by the wars in which Holland was involved at that time. 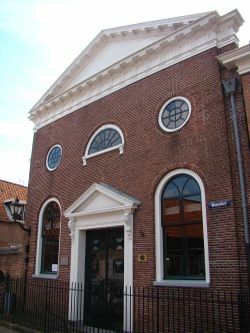 In 1771-1806 Jan Nieuwenhuyzen, founder of the "Maatschappij tot nut van 't Algemeen", served the Monnikendam congregation as preacher. He was followed by Govert Jans van Rijswijk 1806-1808, Reitze de Vries 1809-1814, and 1817-1858, Jacob Julius 1860-1862, J. van der Ploeg 1863-1883, S. J. Defcker 1884-1891, J. N, Wiersma 1894-1896, E. M. ten Cate 1896-1904, E. Pekema 1907-1909, F. F, Milatz 1910-1918, and P. H. Veen 1919-1933. After a vacancy of nearly two years in the pulpit the congregation made an agreement in February 1935 with the neighboring Edam congregation, and was since served by the Edam pastor. Concerning membership no figures were available for the 19th century. In 1847 the baptized membership numbered 60; it was 85 in 1897, 74 in 1955. There was a ladies' circle. The 1950s church dated from the 19th century; it had a copper lectern from the 17th century, no doubt from a former meetinghouse. Cate, Steven Blaupot ten. Geschiedenis der Doopsgezinden in Holland, Zeeland, Utrecht en Gelderland, 2 vols. Amsterdam: P.N. van Kampen, 1847: I, 24, 44, 332, 355; II, 204, 232. Hege, Christian and Christian Neff. Mennonitisches Lexikon, 4 vols. Frankfurt & Weierhof: Hege; Karlsruhe: Schneider, 1913-1967: v. III: 160. Hoop Scheffer, Jacob Gijsbert de. Inventaris der Archiefstukken berustende bij de Vereenigde Doopsgezinde Gemeente to Amsterdam, 2 vols. Amsterdam: Uitgegeven en ten geschenke aangeboden door den Kerkeraad dier Gemeente, 1883-1884: I, Nos. 20, 31, 75, 80, 94, 98-100, 110, 113, 116 f. 137, 445, 708, 860, 1164, 1180; II, Nos. 2142 f.; II, 2, No. 296. Kühler, Wilhelmus Johannes. Geschiedenis der Nederlandsche Doopsgezinden in de Zestiende Eeuw. Haarlem: H.D. Tjeenk Willink, 1932: 87, 173-175, 340, 349. Mellink, Albert F. De Wederdopers in de noordelijke Nederlanden 1531-1544. Groningen: J.B. Wolters, 1954: 158-164 and passim. Reliwiki. "Monnickendam, Weezenland 15 - Doopsgezinde Vermaning." 22 April 2014. Web. 13 October 2014. http://reliwiki.nl/index.php/Monnickendam,_Weezenland_15_-_Doopsgezinde_Vermaning. Zijpp, Nanne van der. "Monnikendam (Noord-Holland, Netherlands)." Global Anabaptist Mennonite Encyclopedia Online. 1957. Web. 24 Apr 2019. http://gameo.org/index.php?title=Monnikendam_(Noord-Holland,_Netherlands)&oldid=144425. Zijpp, Nanne van der. (1957). Monnikendam (Noord-Holland, Netherlands). Global Anabaptist Mennonite Encyclopedia Online. Retrieved 24 April 2019, from http://gameo.org/index.php?title=Monnikendam_(Noord-Holland,_Netherlands)&oldid=144425. Adapted by permission of Herald Press, Harrisonburg, Virginia, from Mennonite Encyclopedia, Vol. 3, pp. 740-741. All rights reserved.